Join the students at Stardust Space Academy, while they go on missions to learn new facts while having fun. With engaging and fun characters the leader of the Space Racers, and Hawk. Oso: It's all part of the plan... more or less. The kid doesn't know how to color in a coloring book??? which actually was a bit too advanced for the show's audience, I believe. I think the repetition, colorful characters and catchy songs are great for its target preschool audience, but like other reviewers have said, they could have done a much better job making the show entertaining for the preschoolers' older siblings and parents. This is the standard that was set more than 40 years ago by Sesame Street. Sometimes I chuckle at the Bond-inspired mission code names, but the humor is lost on my daughter, and I sometimes have difficulties explaining it to her—I don't want to be talking about a "golden gun" while we're watching a children's show about a teddy bear! I am also not quite comfortable with the message the show sends to its young viewers. Oso is not very bright, clumsy, forgetful, and doesn't really help anyone. The writers carry this to an extreme. In fact, in most episodes, the child ends up showing HIM how to accomplish the task. That might be a great learning tool for the "rescuee", but why does Oso get a medal for bungling each mission? Rewarding children for trying their best rather than only for perfection is great, but is Oso really doing his best? He seems careless to me, and his efforts to learn seem half-hearted. 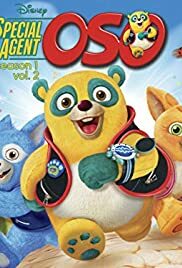 so annoying, I often leave the room when Special Agent Oso is on. I also agree with the other reviewer who commented that Paw Pilot's "floating head" is rather creepy. It doesn't bother my daughter, but it creeps me out every time I see it, for some reason.